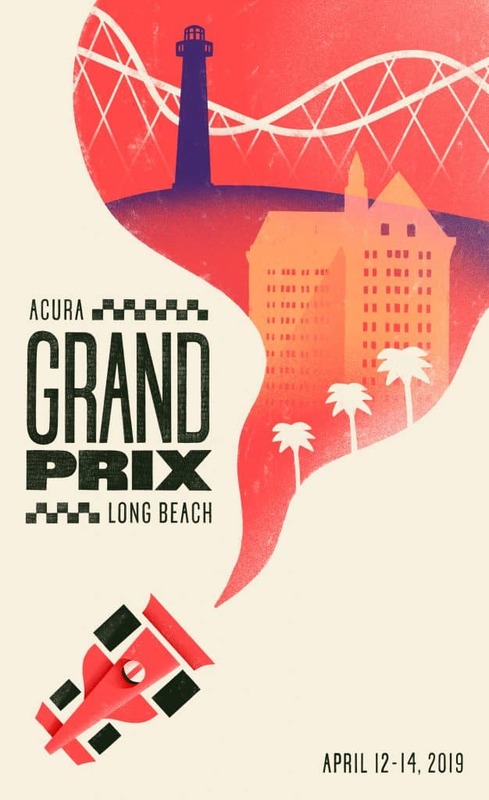 Poster by artist Randy Owens for the 45th Acura Grand Prix of Long Beach in 2019. Courtesy GPLB. 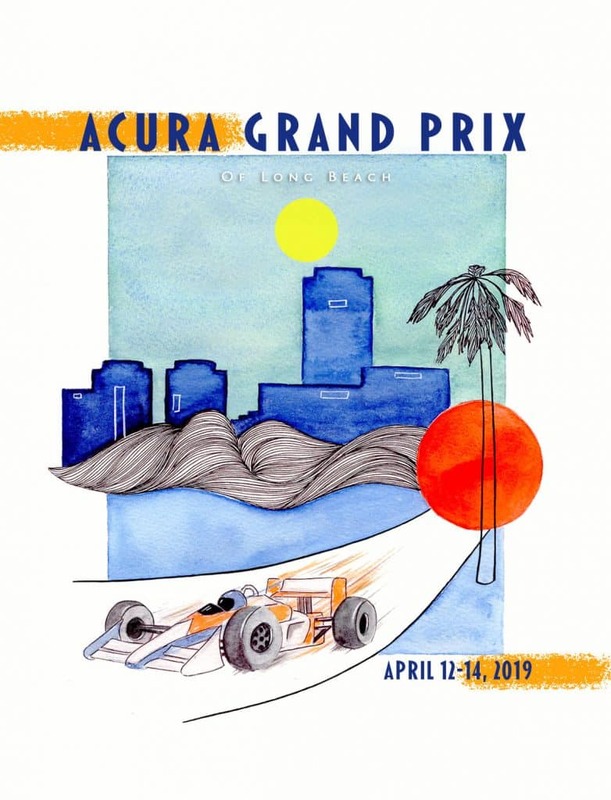 It all started with what the Long Beach Post’s Arts & Culture section thought would be a fun idea: go beyond simply announcing the Acura Grand Prix of Long Beach’s new poster and poster artist for the year and, instead, provide readers with a bit of recent history, i.e. view each poster of the last decade. We wanted to see how the art had evolved and thought readers might enjoy that as well. 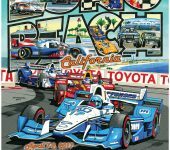 So I asked Grand Prix spokesman Chris Esslinger to send me the posters and found that, aside from a few outliers, artists generally stuck to cramming images of crowded grandstands, iconic Long Beach buildings like the Villa Riviera and zooming race cars into the allotted poster-sized space; all fair depictions of the crowded event (click or tap on a poster below to enlarge). 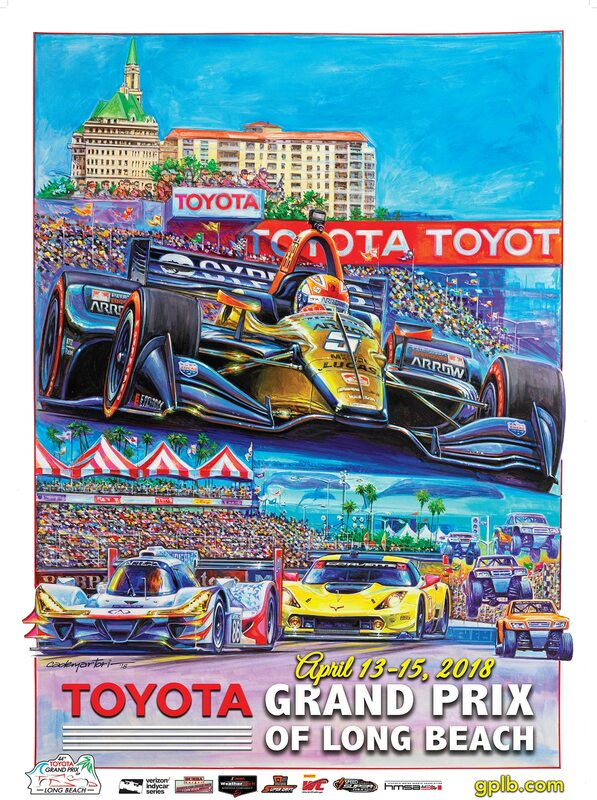 Poster by Hector Cademartori of the 44th Toyota Grand Prix of Long Beach in 2018. Courtesy GPLB. 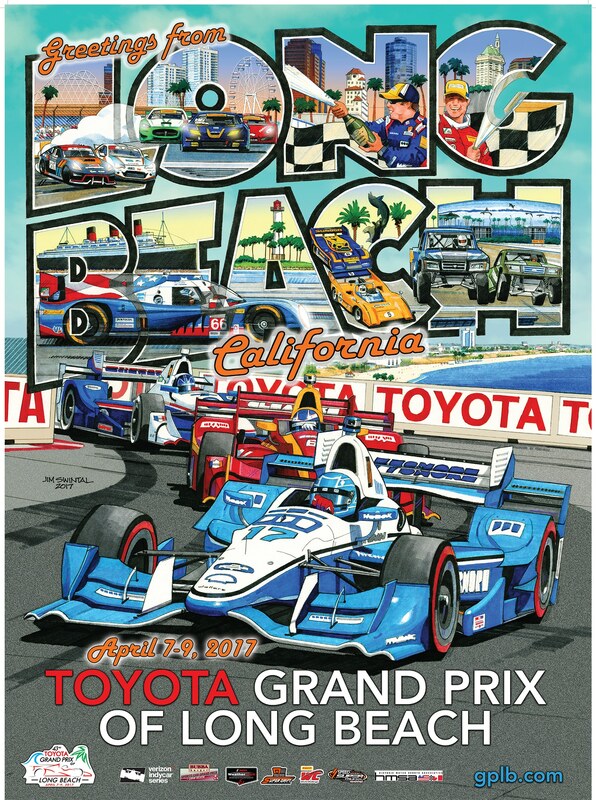 Poster by Jim Swintal for the 42nd Toyota Grand Prix of Long Beach in 2017. Courtesy GPLB. 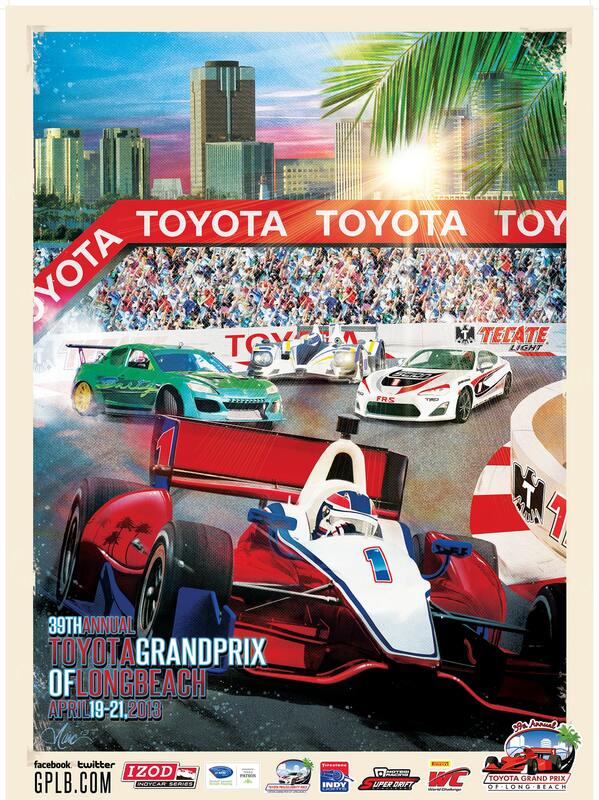 Poster by Erwin Dazelle for the 42nd Toyota Grand Prix of Long Beach in 2016. Courtesy GPLB. 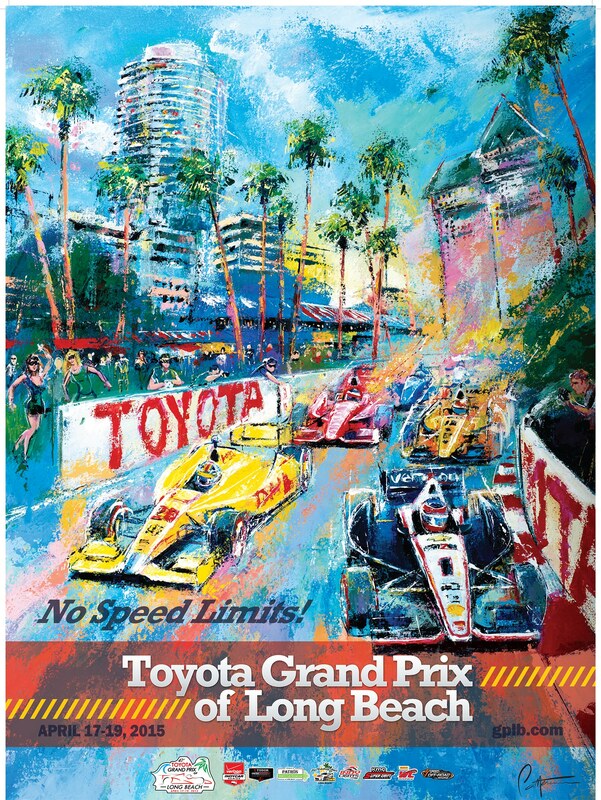 Poster by Bill Patterson for the 41st Toyota Grand Prix of Long Beach in 2015. Courtesy GPLB. 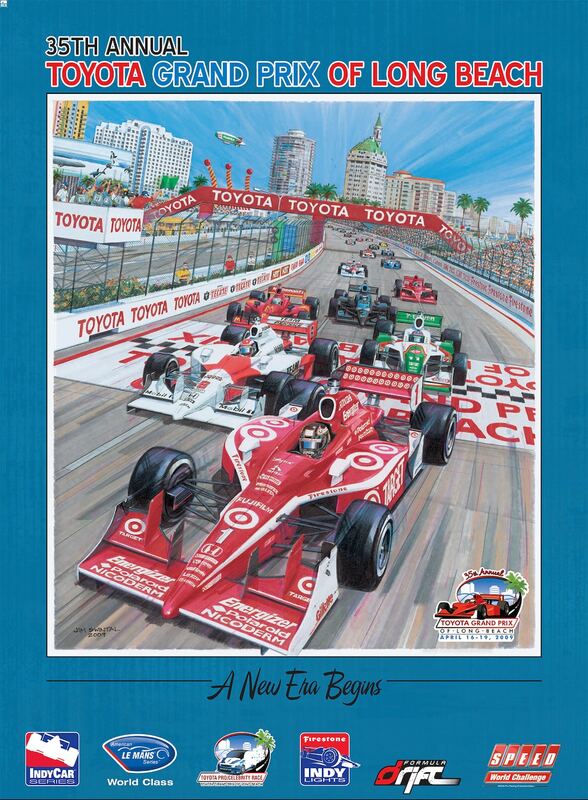 Poster by Randy Owens for the 40th Toyota Grand Prix of Long Beach in 2014. Courtesy GPLB. 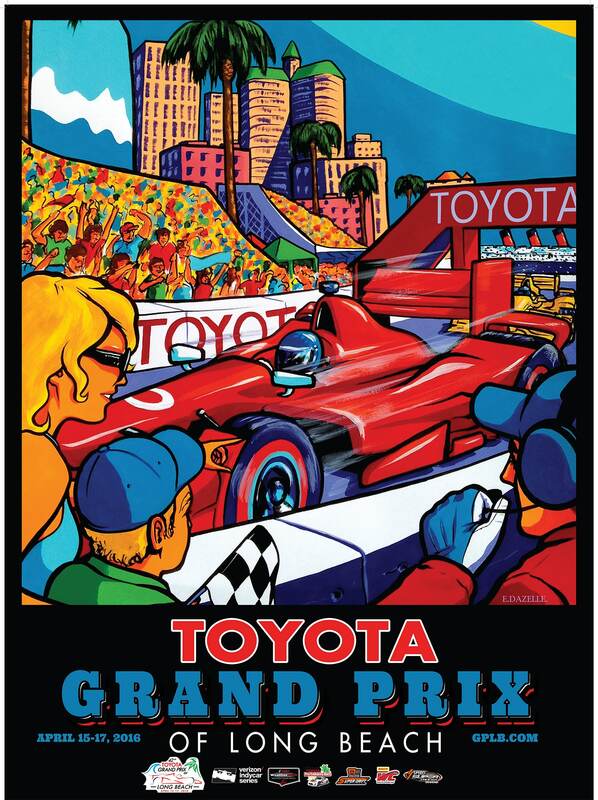 Poster by Marc Wolfe for the 39th Annual Toyota Grand Prix of Long Beach in 2013. Courtesy GPLB. 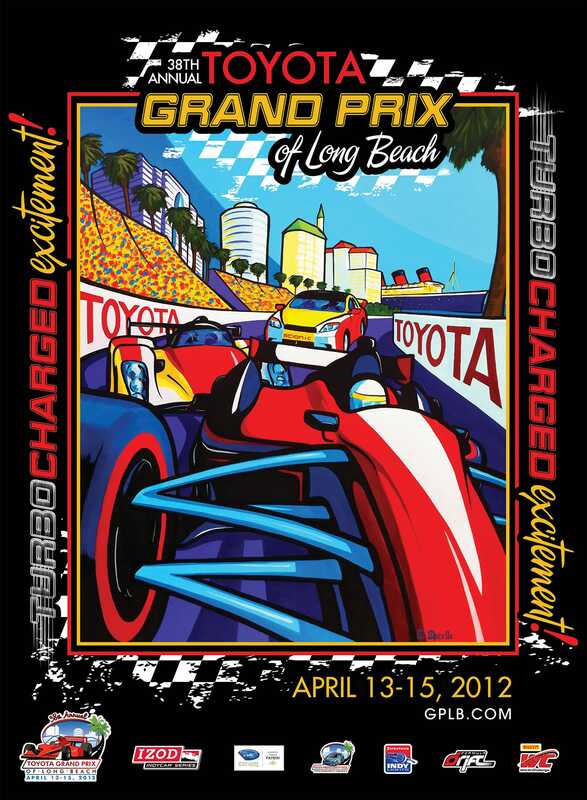 Poster by Erwin Dazelle for the 38th Annual Toyota Grand Prix of Long Beach in 2012. Courtesy GPLB. 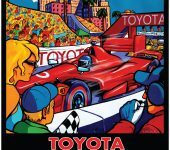 Poster by Tobias Geye for the 37th Annual Toyota Grand Prix of Long Beach in 2011. Courtesy GPLB. 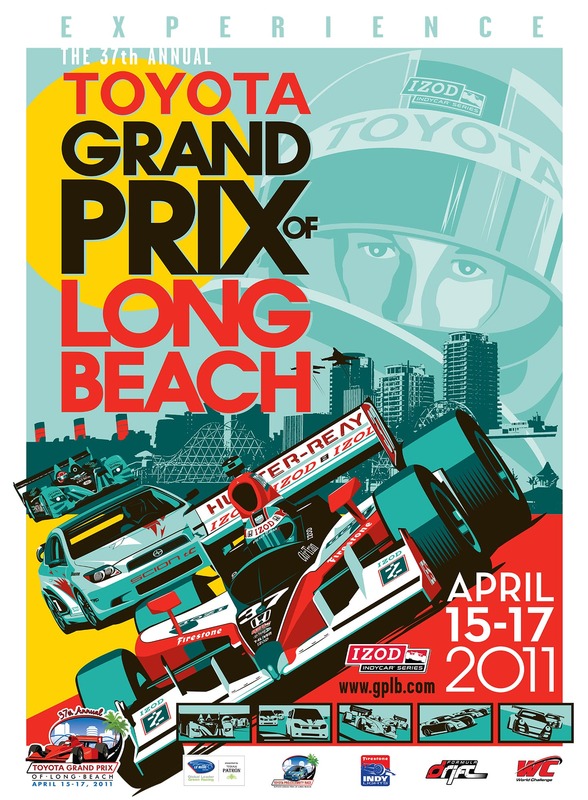 Poster by the Grand Prix’s graphic design team for the 36th Annual Toyota Grand Prix of Long Beach in 2010. Courtesy GPLB. 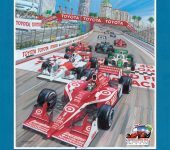 Poster by Jim Swintal for the 35th Annual Toyota Grand Prix of Long Beach in 2009. Courtesy GPLB. 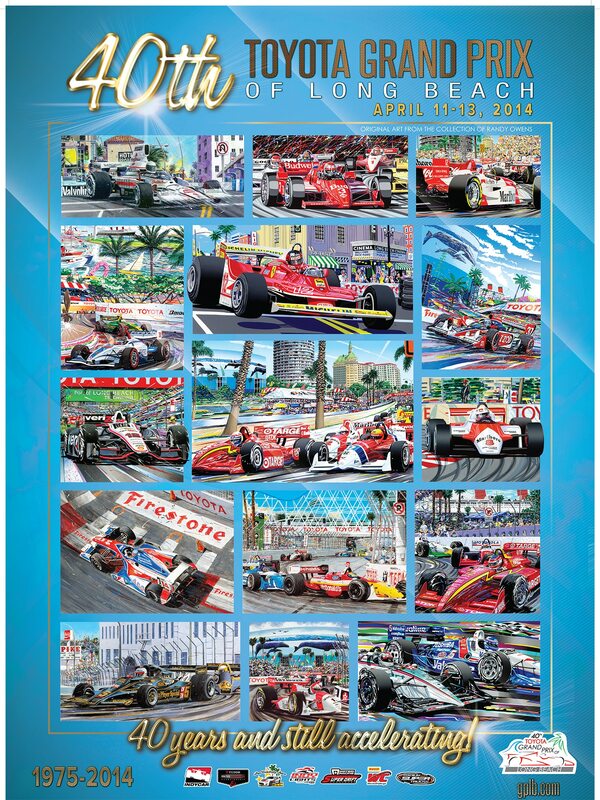 It was all very fun until I started looking at the artists; Jim, Bill, Erwin, Jim again, Hector, Randy, Randy again, Marc… and a question came to mind: how the artists were selected and if a woman had ever designed a Grand Prix poster? 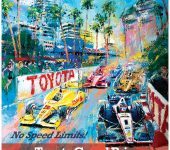 It turns out, in the 45 years the Grand Prix of Long Beach has been a thing, not once has a woman designed the event’s poster art. “We haven’t yet had a female artist, but we’d be interested in seeing if any are available and interested,” Esslinger said in an email. Well, they are and they are. While it seems to have taken 45 years for the Grand Prix to consider the idea, we found five women in three days who, in less than three weeks, produced five posters. 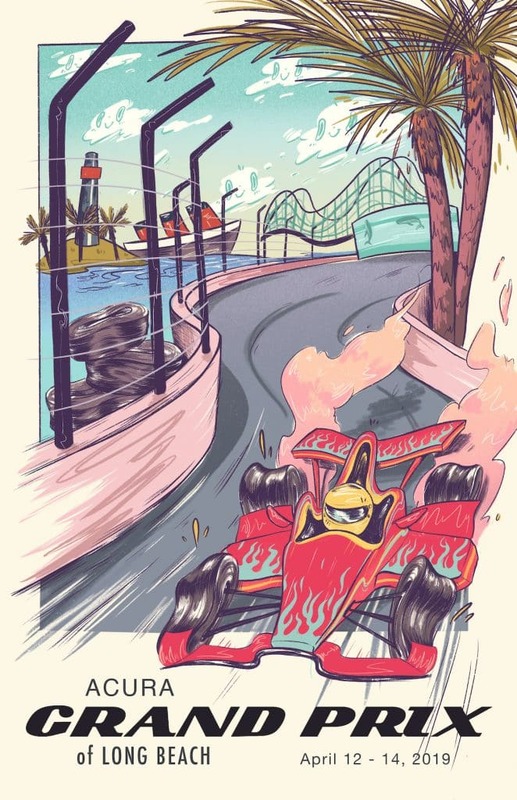 Five women who, while also including the expected visuals (race cars, Long Beach landmarks) put a yet-to-be-seen—at least in the last 10 years—creative spin on branding the almost-half-century-old event. And given the time frame, I doubt these artists were firing on all cylinders, i.e. free of our ridiculously tight deadline, they most certainly would have been able to go next level with their creations. 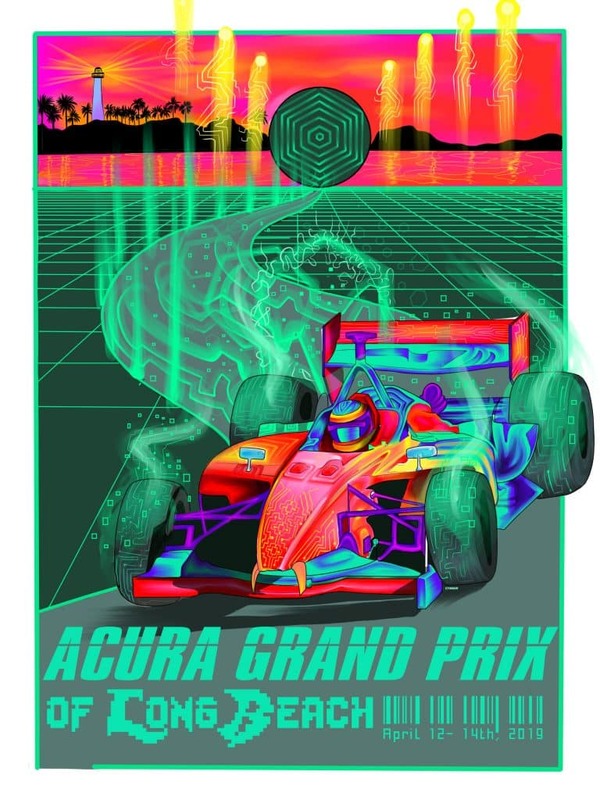 Imagine if they had multiple months to work with event organizers and Acura, the Grand Prix’s new title sponsor? Imagine if they had that support and exposure? Esslinger said “there isn’t really a set method for selection,” but that they try to pick an artist by the fall so they can have a completed piece by Jan. 1, a few months before the race in April. 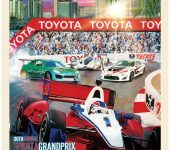 This year’s pick, Randy Owens—who also designed the poster in 2014—was sought out by the Grand Prix for the 2019 poster because he’s a well-known artist in motorsports. Artist Erwin Dazelle, who created posters in 2012 and 2016, reached out on his own accord. Sometimes the posters are created in-house. 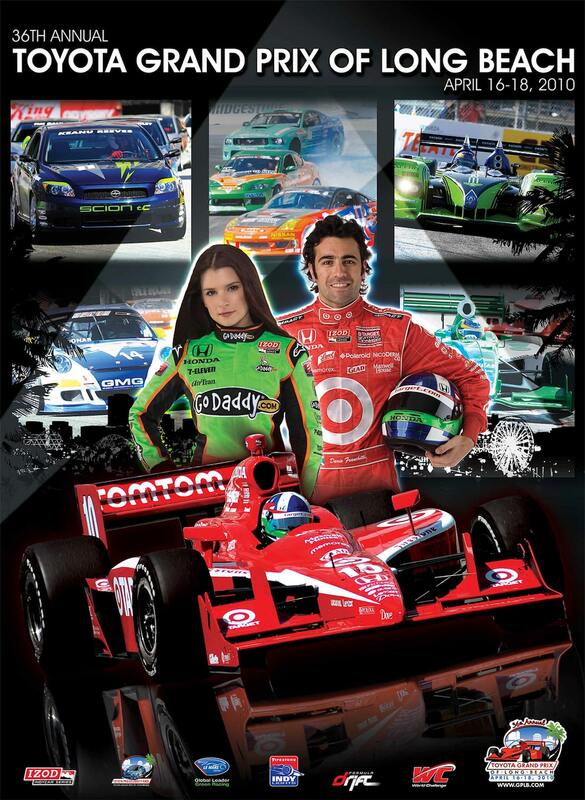 In 2010, for example, the graphic design team came up with a way to showcase that Danica Patrick, the only woman to win an IndyCar race, was competing in Long Beach with Dario Franchitti as the Grand Prix’s defending champion. That photo collage was… to the point. “We do get submissions/ideas almost every year, however,” Esslinger said. Yes, yes it’s a male-dominated sport, yes, perhaps there are more men interested in drawing race cars than women, but it’s 2019 and let’s be honest, male artists have been defining the female form, and activity, for centuries. Impressionist painter Edgar Degas’ depictions of ballerinas in the late 1800s are beloved, yet Degas was not a dancer. Neither was Toulouse Lautrec. The issue has been so rampant there’s a term for it, “the male gaze,” coined in 1975 by film critic Laura Mulvey. 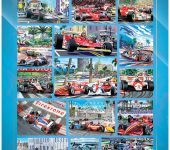 You can even kinda see it in a certain Grand Prix poster of 2016. 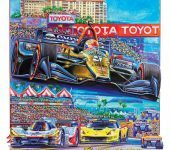 A sun-kissed, blond-haired mother and her son gaze cheeringly at a male race car driver, where a certain chest-centered curvature is used to string your eye across the art. Speaking of the male gaze, this year the Grand Prix got rid of its “Miss Grand Prix” pageant; a small step in a progressive direction that shows, for whatever reason—whether equality or losing a sponsor—that we’re past catering to the bug-eyed beauty pageant crowd. The Grand Prix may be considered a city within a city, bringing in thousands of outsiders who may not give a hoot about who designs what, but hell, it’s in Long Beach, a city very proud of its diversity, a city which in 2014 elected its first openly gay, and first Latino, mayor, a city where the mayor from 1994 to 2006 was a woman—Beverly O’Neill—who served an unprecedented three terms, a city that shouldn’t throw those values to the wind when it comes to promoting its largest event of the year. 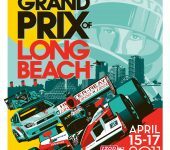 The Grand Prix of Long Beach is in Long Beach, not a vacuum, right? Artist: Cynthia Flores’ work explores the concept that dimensional universes exist. She is very attracted by the potential of what our subconscious can provide to our consciousness. Most of her artwork focuses on the unknown, which includes death, dimensional worlds, and the unlimited potential that our subconscious provides for ourselves. Behind the Design: My inspiration for this piece was to display credibility as a female artist in a male-dominated industry. The artwork is to highlight the apprehension individuals experience when pursuing their passions. Artist: Crisselle Mendiola is an illustrator based in Santa Ana. Often switching between traditional and digital mediums, her distinct style has a certain flow and cartoon-like look to it. Her works are usually character driven, often expressing emotions and feelings which are captured through her distinct style. She aims to tell a story and let people who view her work relate or empathize with it. Behind the Design: I commute through Shoreline Drive to get to work, so each year when the Grand Prix prepares its track, I get to drive the track that the racers drive through. I catch myself daydreaming of what it would feel like to race on that road, zooming through that street with a fast car. So, with this poster, I wanted to capture the landmarks that make Shoreline Drive beautiful, led by a racer who is blazing through the course. Behind the Design: For this piece, I was challenged to get out of my comfort zone and draw subject matter extremely different from my typical work, but I wanted to be able to include elements that I use often. I was inspired by the Grand Prix posters of decades past and a picture of the Pike facing the Ferris wheel and the Cyclone Racer Bridge. I was able to portray these two known features of our city with my usual line formations representing the bridge and a solid circle suggesting the Ferris wheel. I chose to do this in order to keep integrity in my style and to ensure that the car, which is the only detailed feature, is the focus of the viewer. Artist: Sam Joy Flores is an illustrator and designer from Long Beach and is currently studying in the BFA program for Graphic Design at CSULB. She will be graduating in Fall, 2020. Afterward, she plans to continue pursuing a career that allows her to do both illustration and art direction. Discovering graphic design allowed her to integrate illustration and other art mediums into one practice. One of her first interests was the art of gig posters, a practice that invited endless creative freedom, while still integrating formal elements of design like typography and balance. Since then, she has always been fascinated by printmaking and the screenprinting process, including the beautiful textures they create, which is what inspires her current work. Behind the Design: I wanted to stray away from the commercial look that the Grand Prix usually has and, instead, I went with a more minimal composition. I was inspired by the clean look of Saul Bass while maintaining the textures and movement in my poster. 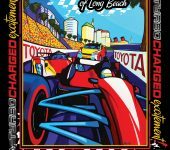 The idea behind the final design was to have Long Beach in the forefront of the poster but still preserve the racing theme. 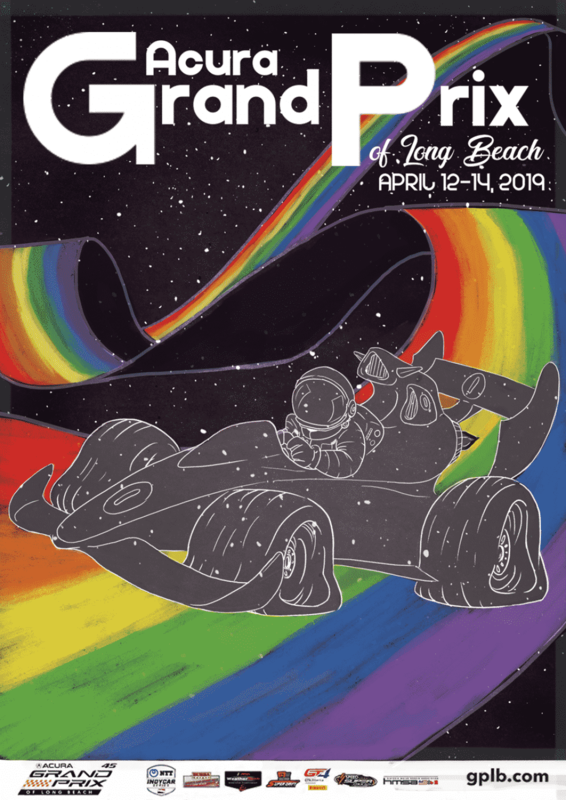 Because the race has been hosted in Long Beach for 45 years now, I think it was crucial to incorporate some of the city’s landmarks since it’s such an iconic aspect of the Grand Prix itself. Artist: Originally from Colorado, Camerene Yong is an illustrative artist residing in West Covina, working with mostly traditional mediums and dabbling digitally, occasionally. She enjoys a wide range of mediums but sticks mostly to acrylics, gouache and watercolors for painting and charcoal and technical pens for drawing. Yong doesn’t really have a specific style, as she loves hyperrealistic art as well as stylized drawings. Behind the Design: This piece is inspired by a very retro aesthetic. As a kid, I would play a lot of racing games with my family, and Mario Kart was one of them, so I had the idea to base my design off the rainbow tracks on one of the levels, and since they were in space I decided to go with an astronaut driver. All the Grand Prix posters were designed so realistically I wanted to take a more fun approach, by making it colorful and cartoony.